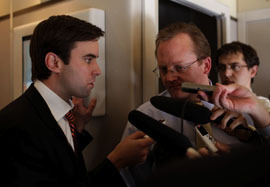 Michael Scherer with White House press secretary Robert Gibbs. Photo by Callie Shell/Aurora for Time. True to his roots as a creative writing major at UCSC, Scherer strives for vivid language as compelling as the facts unearthed by his vigorous reporting. "Personally, the thing I still get the greatest joy out of is that one good sentence," said Scherer, now Time's White House correspondent. "I still aspire to writing the kind of magazine piece you read and show friends, telling them, 'You have to read this'--where you learn more than the subject matter; you learn something about the world." Scherer, who covered John McCain during the presidential campaign, says he is regularly impressed by the pomp surrounding the presidency. "I've been spending a lot of time on Air Force One lately, and you know, I never really thought I'd be flying around on Air Force One," he said. "They have napkins that say 'Aboard the presidential aircraft.' Every now and then I look around and ask myself, 'What are you doing?' I'm having a great time. It's a pinch-yourself job." Five weeks into Barack Obama's presidency, Scherer shared a few observations of the popular president. "He's as good as any politician I've seen at doing politics--working the room, delivering a speech, appearing to be human and sincere," he said. "On the most basic level, he's incredibly talented. But it's too early to tell how it's going to play out." "One thing I can say is the 'super-cool thing' is very real," he said. "He can handle an enormous amount of pressure and numerous tasks in a very even, almost detached way. He's very different from McCain, who was more fly-by-the-seat-of-his pants. McCain liked the dog fight. Obama is more reflective. He seems very aware of what he's doing as he does it." That said, Scherer is mindful of history and what he called the "crucial flaw" that has plagued every modern American president. "I'm not sure what Obama's is, but I'm pretty convinced he's not going to be flawless," he said. Scherer, like fellow UCSC alumna Dana Priest who has won two Pulitzer Prizes for reporting at the Washington Post, has a knack for investigative reporting. After graduating, he did a two-year stint at a daily newspaper in western Massachusetts, then moved to Mother Jones, where he contributed to the muckraking magazine's exposÃ© of campaign financing that ran just before the 2000 presidential election. He earned a master's degree from the Columbia University Graduate School of Journalism and covered Washington D.C. for Salon.com before joining Time in December 2007. He covered Republican candidates Mike Huckabee, Mitt Romney, and McCain before landing the coveted White House beat on January 3. Between regular posts on Time.com's political blog "Swampland" and writing for the magazine, the job is pretty unrelenting. Scherer, who had only five days off during his first eight weeks in the White House, jokes that Obama gets more time to work out in the gym than he does. "It's a very different kind of life here," conceded Scherer, 33, a native of San Francisco. "I mean, I'm a California boy. People here work all the time. But I still have a life." Although he covers the president and has been in the Oval Office--"I remember being very impressed by a large bowl of apples on the coffee table--it's still there. I've seen it in pictures"--Scherer isn't yet on a first-name basis with Obama. "I've been introduced, and I got to shake his hand, but I covered McCain during the campaign," he said. "I haven't interviewed him yet." Scherer likens the mechanics of covering the president to the task of covering the mayor of a small town, but he admits to a case of nerves during Obama's first open press conference as president. "When I had to write about it afterward, I realized I hadn't paid that much attention to what he was saying because I was so worried about what question I was going to ask if he called on me," recalled Scherer, adding: "I didn't get called on." And Scherer is still getting used to the fact that his workday often unfolds on live national television. "The cable networks cover the White House press briefings live, but you forget eight to 10 cameras are on you," he said. "My parents called to tell me a friend had called them to say (White House spokesman Robert) Gibbs called me 'Mike.' That very much impressed my parents." Scherer describes the White House press corps as "this sort of chaotic collision of reporters," and rebuffs a query about whether journalists are overly eager to find fault with the popular new president. "My job is asking questions," said Scherer. "My job isn't to be his friend, and it's not to be unfair. My job is to be a skeptic and hungry for information." Scherer's artful presentation of that information is a talent he honed at UCSC. "I always read a lot, and I always liked words. The creative writing kind of snuck up on me," he recalled. "That's when I realized I really loved writing and was willing to spend my life trying to get good at it. That hasn't gone away. It has only gotten stronger." Shortly after graduation, Scherer discovered literary narrative writing and devoured the works of authors A. J. Liebling, Gay Talese, H. L. Mencken, and others. Lately, he sustains himself with modern American poetry, in part because he has so little free time. Occasionally, he is derided for his literary roots: "I was on the bus with McCain in Iowa in early 2007, and I referred to the French cultural theorist Jean Baudrillard in my story. At least one blogger came after me for that," Scherer said with a laugh. Although Scherer said he didn't come to Washington to cover the White House, he is clearly in his element. A big fan of the television drama The West Wing--"I still believe the second season of West Wing is the best season ever in the history of television"--Scherer was drawn to what he called the "white-collar fantasy" that underlies the show. "The premise of West Wing is that you can work incredibly hard at something that matters, and that it's not just about making money, and that it can be fulfilling," he said. "I've always wanted a job like that, and I guess I've got it now." You can follow Michael Scherer on Twitter @michaelscherer.